Many people who rent dream of owning their own home. But saving the money for a deposit while paying rent every month can be a real challenge. The new Earn Your Deposit scheme solves this problem for ThamesWey tenants by offering them a substantial financial contribution towards the deposit needed to buy a place of their own. It makes becoming a home-owner a reality, sooner. Each year, ThamesWey sets aside a sum of money based on the size of the rental property. 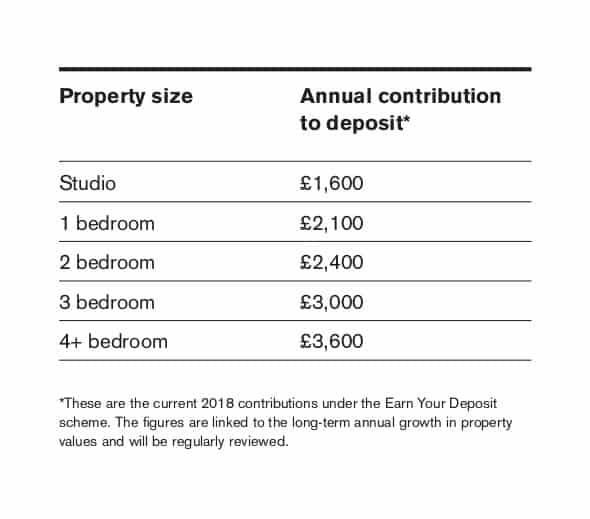 Under the current 2018 scheme, the contribution paid for a studio apartment would be £1,600, rising to £2,400 for a two-bedroom home and £3,600 for a four-bedroom house. The amounts paid are based on the long-term growth in property values and are reviewed periodically. At the end of each year, ThamesWey will write to tenants to tell them how much value they have built up under the scheme. Up to £80,000 can be accumulated in this way, representing a substantial lump sum towards a deposit. Earn Your Deposit is available to all existing and new ThamesWey tenants on assured shorthold tenancies. To qualify, they just need to be good tenants – for example by paying their rent on time, looking after the rental property, and being considerate neighbours. The deposit can be split between people in shared tenancies. The Earn Your Deposit lump sum is portable, so as long as someone remains a ThamesWey tenant they can move between bigger or smaller properties and take their lump sum with them. When a ThamesWey tenant is ready to buy a property, the money accumulated under the Earn Your Deposit scheme can be released to use towards a deposit, provided there has been a minimum of two years unbroken tenancy. The money can only be used for this purpose and is paid to the solicitor handling the property purchase. It cannot be taken out as cash. The scheme is not available to tenants who already own a property, or to investors, such as people with buy-to-let properties. ThamesWey is both a property developer and landlord – we build homes to sell and to rent. We are also committed to building sustainable communities. That means providing homes for people of different circumstances and financial means. Some people like to rent long-term and others want to buy and get on the property ladder. Helping people become home-owners keeps the property market healthy by increasing the number of buyers across different price levels. It also attracts people to areas where such help is available and means fewer people are priced out when they make the move from renting to buying. Read the Earn Your Deposit FAQ here.